Ladies & Gentlemen…your 2015 SATX Strongest Man & Woman! The history of Strongman in the United States in one picture, and your judges at SATX Strongest. 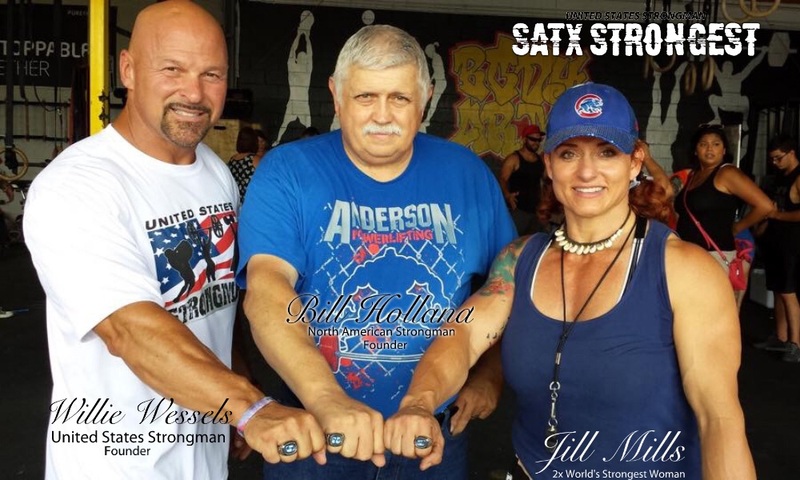 Mr. Bill Holland (center) founded North American Strongman in the summer of 1997 in Saginaw, Texas. The first competition took place on August 31st in a hot dusty horse arena and aptly named the “Texas Strongest Man Contest”. Elite lifters such as Steve Goggins, Duane Hamman, Kevin McAfee, Brian Dobson, Mike Adelman, Dennis Magee, Ed Cosner, Whit Baskin, and Jill and Milo Mills were in attendance.